What if the supply chain, from every corner and process, is organized around the customer's experience? 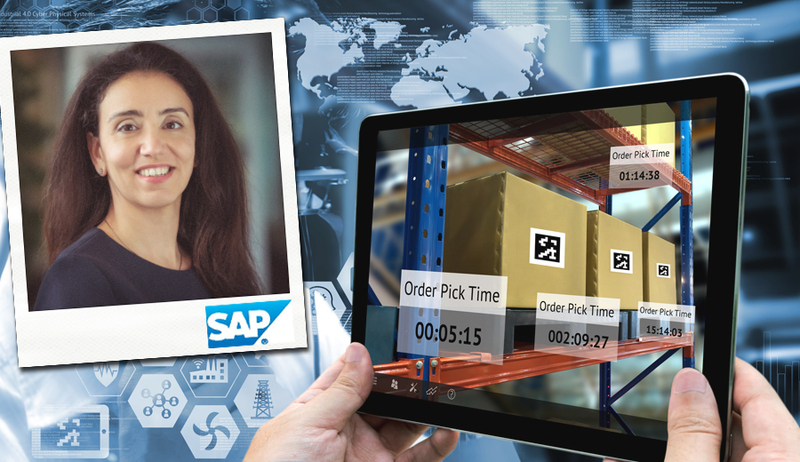 Hala Zeine shares her thoughts with us about the advantages of a customer centric supply chain! In 1998 L'Oréal and UNESCO founded the For Women in Science programme to promote and highlight the critical importance of ensuring greater participation of women in science. The Global Female Leaders summit will proudly host the German award for the second time, during which three young fellows will be honored. 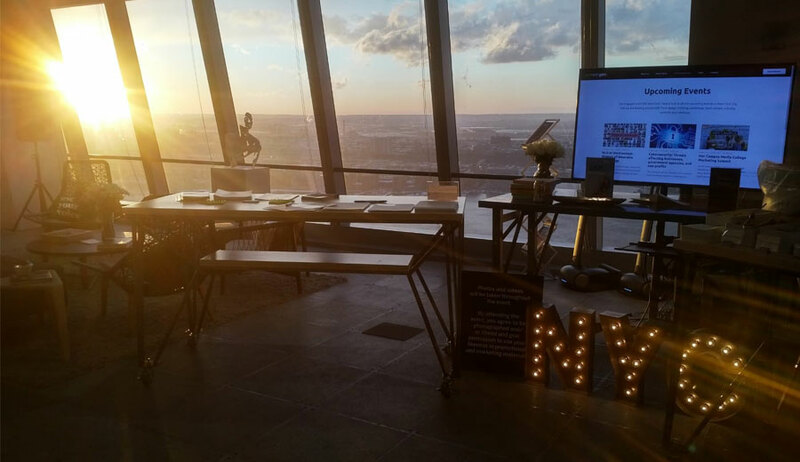 In March once again Linklaters brought selected clients and lawyers together at its women's networking event "Hochkaräter". Read more about the key learnings! 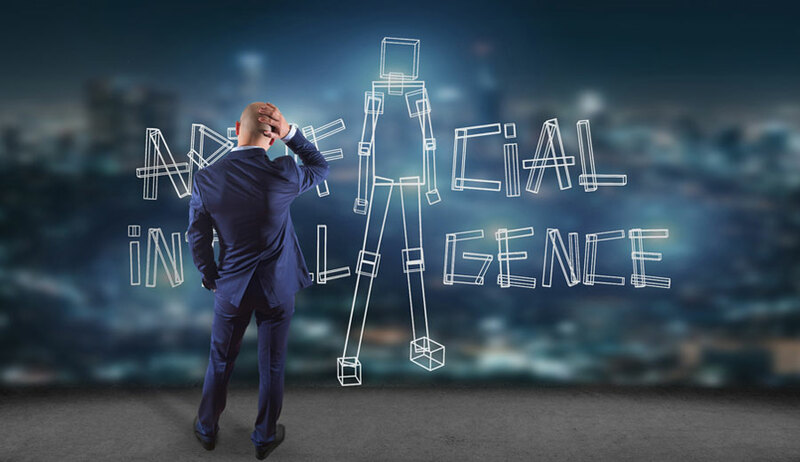 There are many examples which demonstrate the immense breakthroughs in the field of artificial intelligence and the growing adoption of its applications. 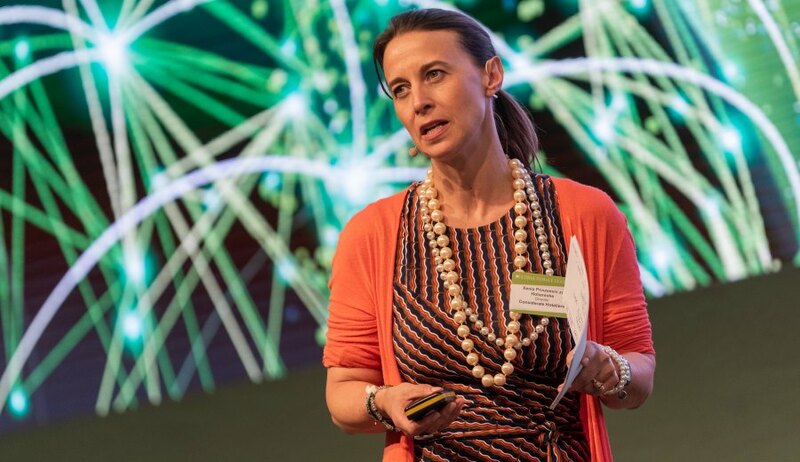 Monika Niederhoff gives an overview on the key trends in using intelligent technologies and the impact on business and society and raises the question of how we can shape the era of intelligent technologies. With advanced technology comes big power. Therefore, we need to think about digital ethics better sooner than later. This article outlines what digital ethics is about and why we need to discuss it as private persons, companies and governments. Let's have a closer look at gender equality in companies like the Financial Times or Bloomberg Media Group! 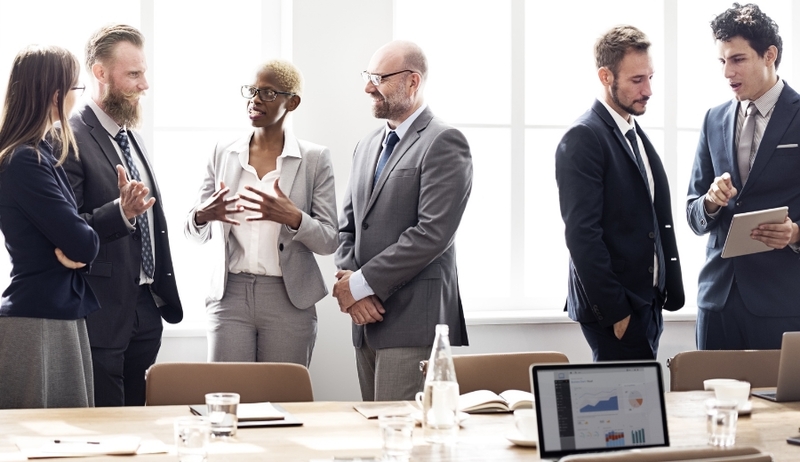 In this article, we would like to focus on why it is so important to have a fair balance between men and women especially in business. Female Leaders: We Need You! If the Financial Times were a person, what would they look like? The reality might surprise you as the FT is much more than a publication for male finance professionals. The FT is offering all friends of Global Female Leaders a free three month guest pass to ft.com. The pass gives unlimited access to digital articles, columns and features and so much more. Have you heard about those three words that can tell exactly where you are – without using any address or coordinates? 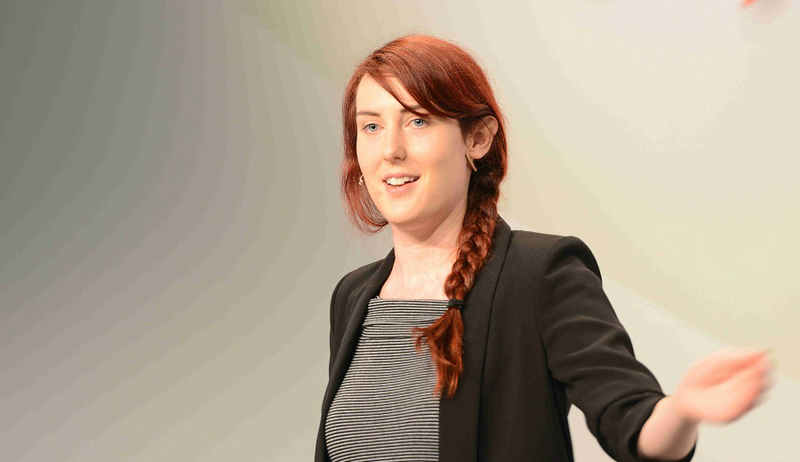 Clare Jones decided to revolutionize the whole navigation industry - but why? And how did she come to her leading position? If you are curious about the answers, read this article! Insights into leadership challenges: What are the essentials for being a good leader? What is really essential for being not only a leader but a pathbreaking leader in times of digitalization? 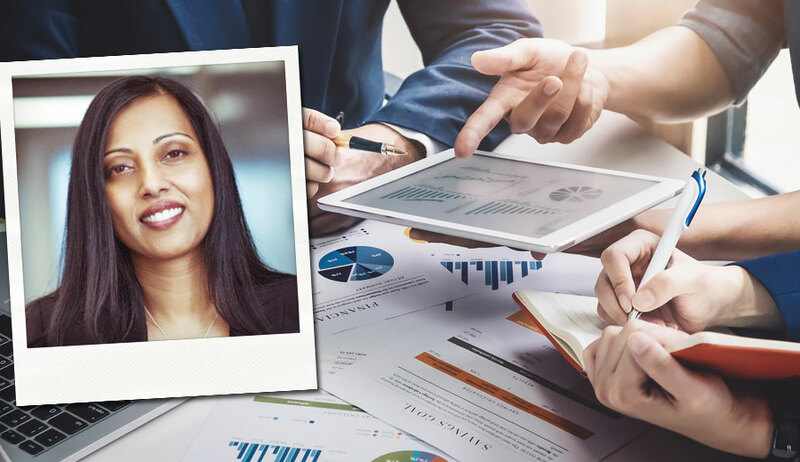 Susan Uthayakumar answers to this question and points out, that she has learned two lessons that really stand out throughout her career. Be curious about it and find out more about the leadership challenges! 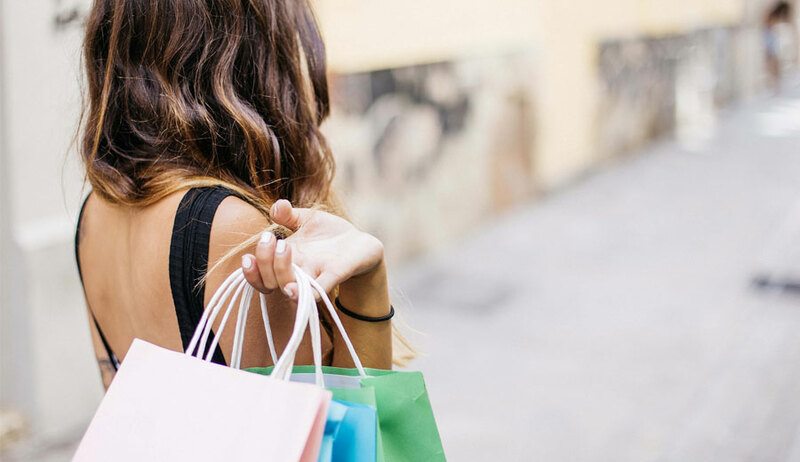 In the age of digitalization, marketers need to thoroughly study the psychology of online consumers as well as offline consumers. So if you are interested in the current practices and future developments of consumer psychology, you need to read this article. How do digitalization, agility and flexibility have an influence on leadership roles, motivation and performances? 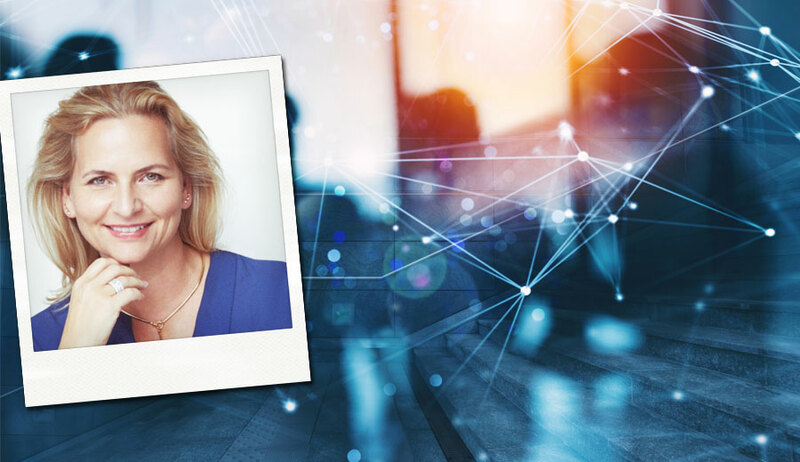 Eva-Lotta Sjöstedt is an internationally experienced senior executive and delivers insights into the challenges of leading in today’s new disrupted world of work. 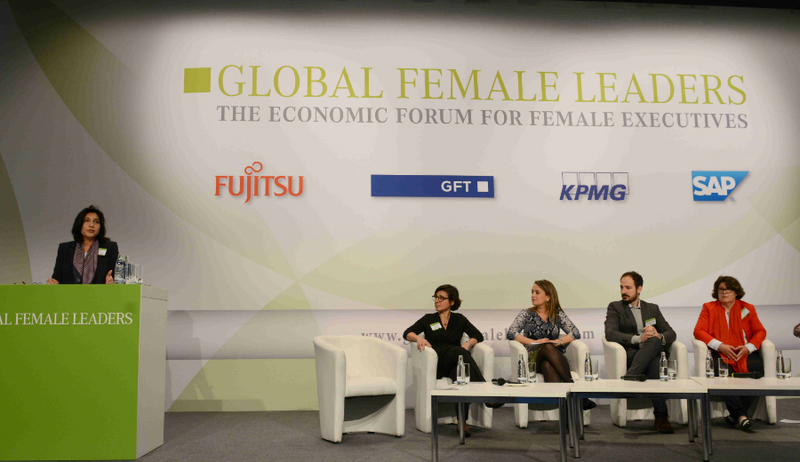 Second Global Female Leaders Outlook (GFLO): Your Voice Matters! 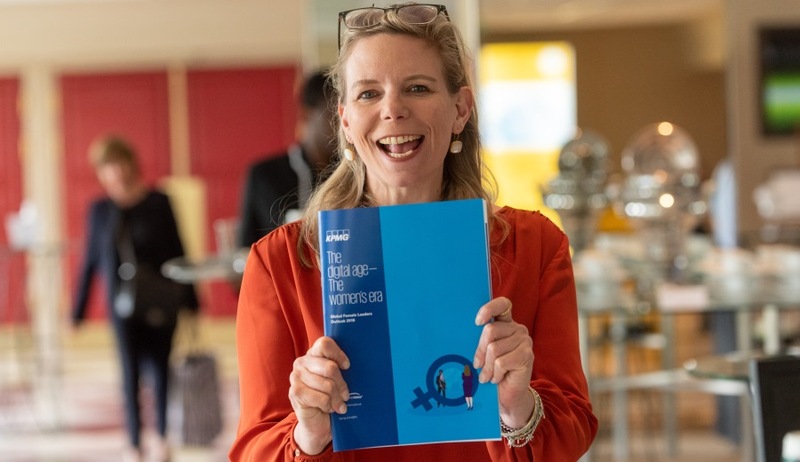 In cooperation, the Global Female Leaders with KPMG International and KPMG in Germany have decided to conduct the Second Global Female Leaders Outlook (GFLO) in order to prioritise the views of female leaders. Be part of this study! Stay fearless and be confident with yourself! 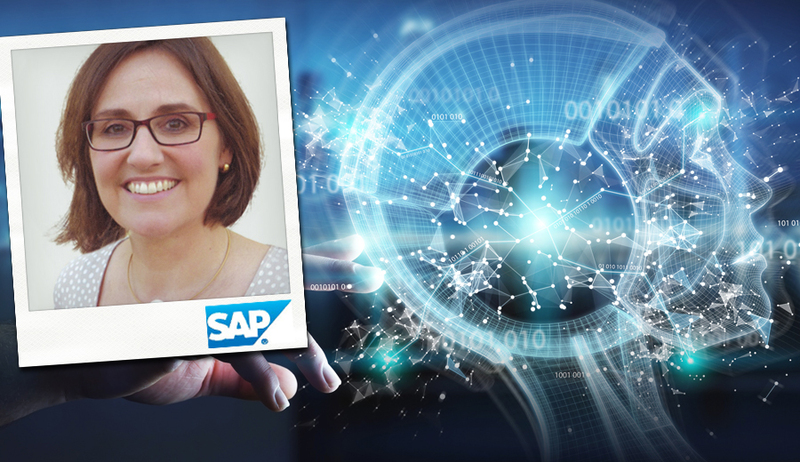 At the end of January, SAP and the Global Female Leaders convened the first Networking Event to connect women leaders from across industries, to start a dialogue, exchange ideas, challenge the status quo, and define the future of the digital economy. Find out more about the key learnings! 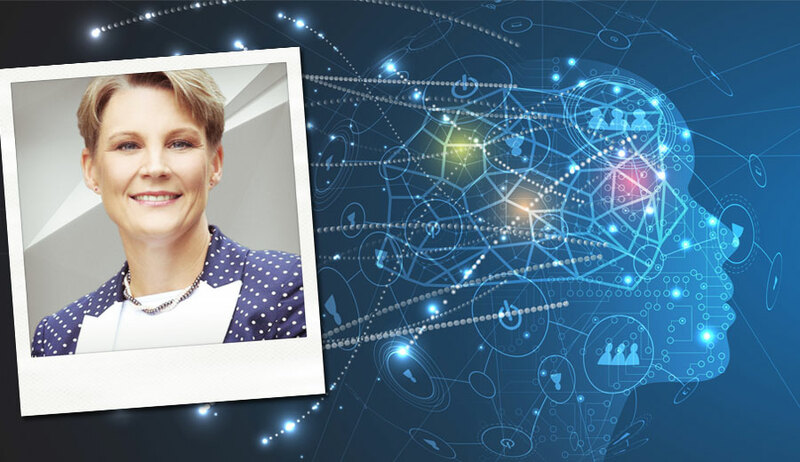 In this interview, Tanja Vainio, CEO at ABB Czech Republic and Slovakia, describes her different leadership roles in the last decades and talks about the next big things to watch as far as digitalization is concerned. Diversity in the workplace matters and has many bottom lines benefits. We would like to give four concrete examples where and why diversity is significant to business success. Sustainable Economic Zones, such as LADOL, are the solutions to unlock the full potential of Africa. 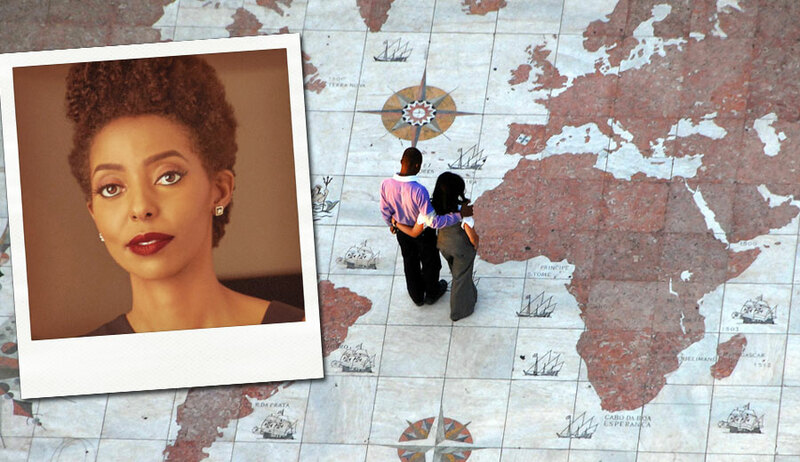 Dr Amy Jadesimi delivers insights into the major opportunities that are given to Africa thanks to LADOL’s daily business and shows how the world can benefit from Africa’s sustainable economic growth. Do you call yourself a female entrepreneur? Do you have the determination to create a business and conquer the world? Here are 10 secrets of successful female entrepreneurs that hopefully inspire and motivate you to start and grow your business today! Research has shown that robots are now taking over jobs in several industries. 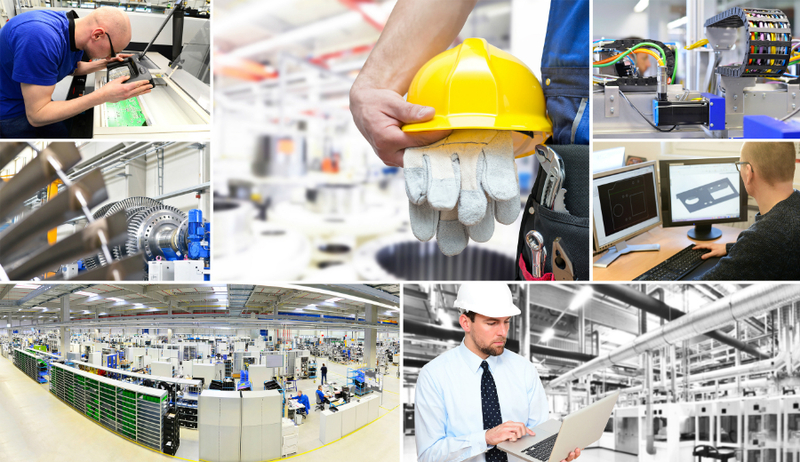 We had a closer look at 6 industries that have already started wiping out some human jobs. In this article, you will get insights into pioneering companies which employ robots in everyday business. 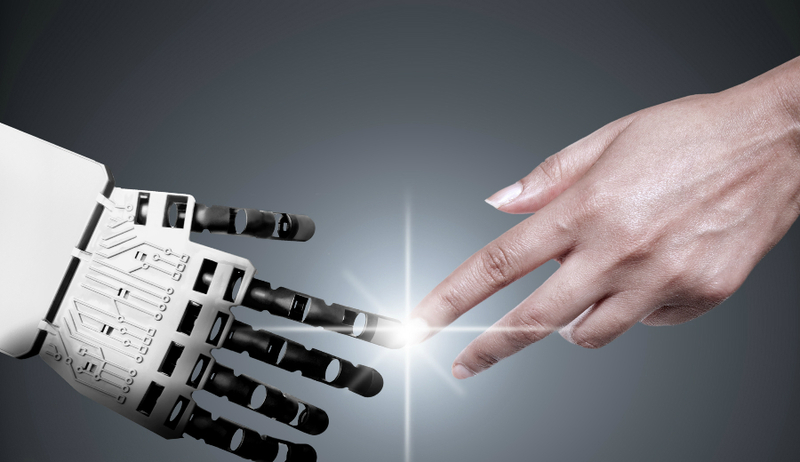 The rise of the robots and Artificial Intelligence is becoming more and more popular in the world of work. Nevertheless, there are several reasons why human experience will remain as key factor for business success. This article will discuss four of them. 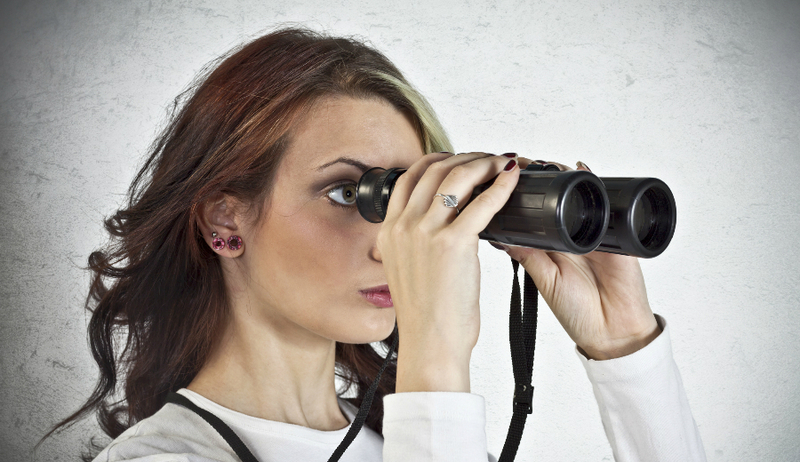 Digital trends are perceived as key factors for future success. 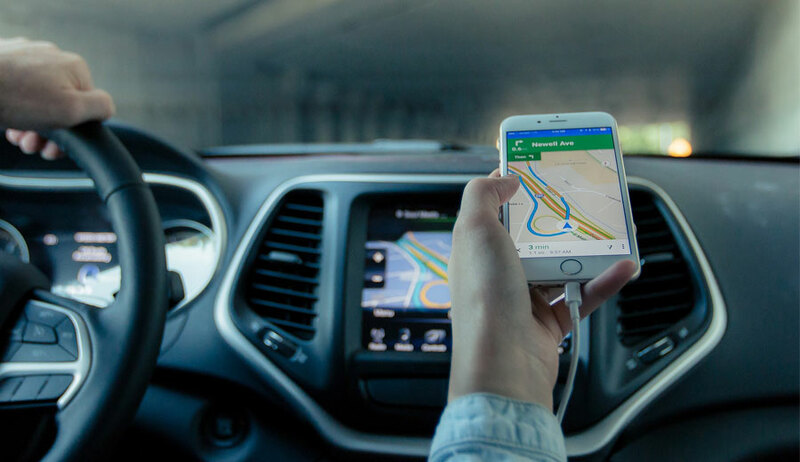 To ensure you are aware of the promising opportunities, here are the five digital trends that will drive your business success in 2020 and beyond. 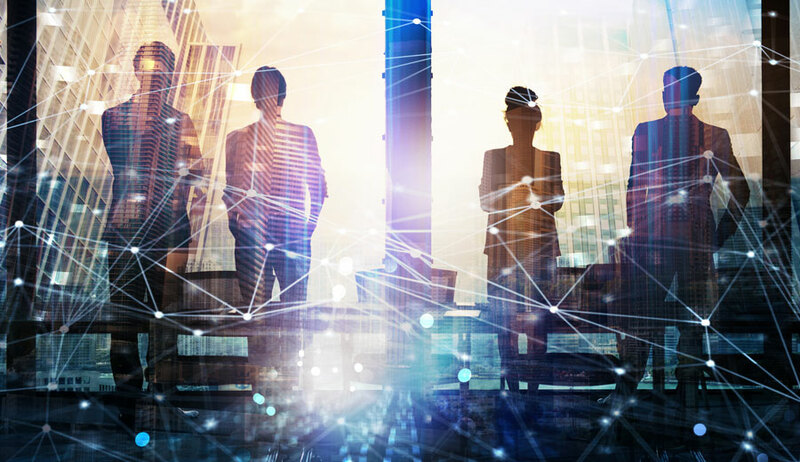 If you want your company to remain competitive in the future, you also need to implement digitalization in the fields of training and education. 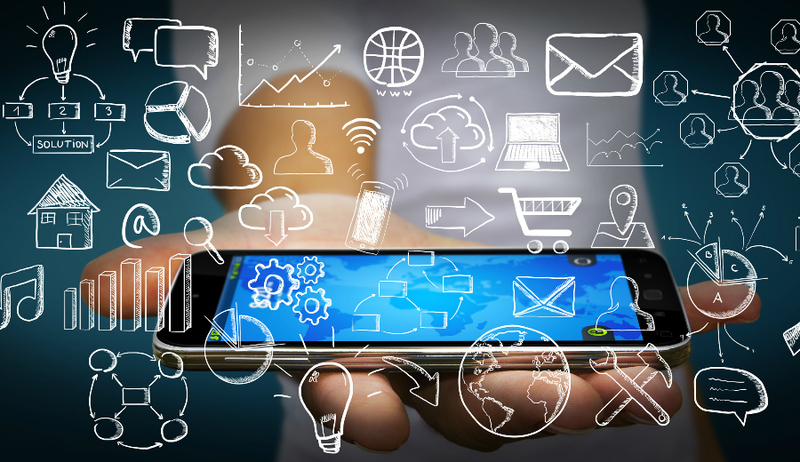 Here are 3 digital training methods vital for the future of your business. What are the skills students will need in the future? And how can students develop these skills of tomorrow? 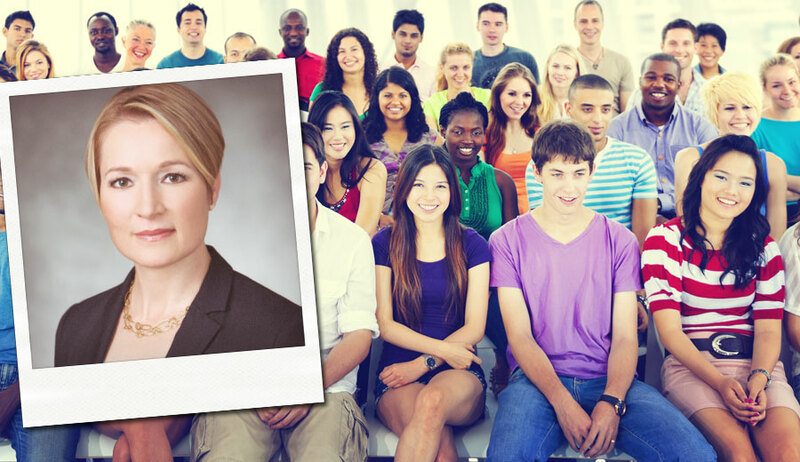 Barbara Holzapfel from Microsoft Education Marketing in the USA explains which tools students will need and how improvements in education are changing their journey. What is happening in the UK? What do we have to expect? And what are the biggest issues for the UK with this deal? 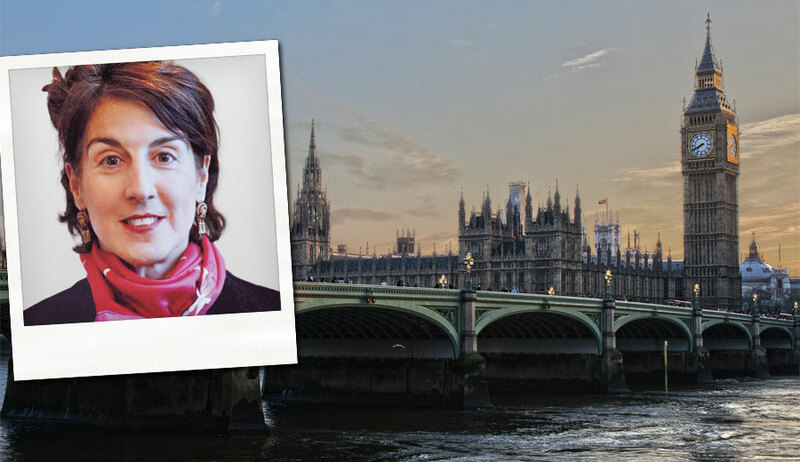 Listen to the interview with Karina Robinson who shared her thoughts with us on the current Brexit debate and the near future for both UK and EU! 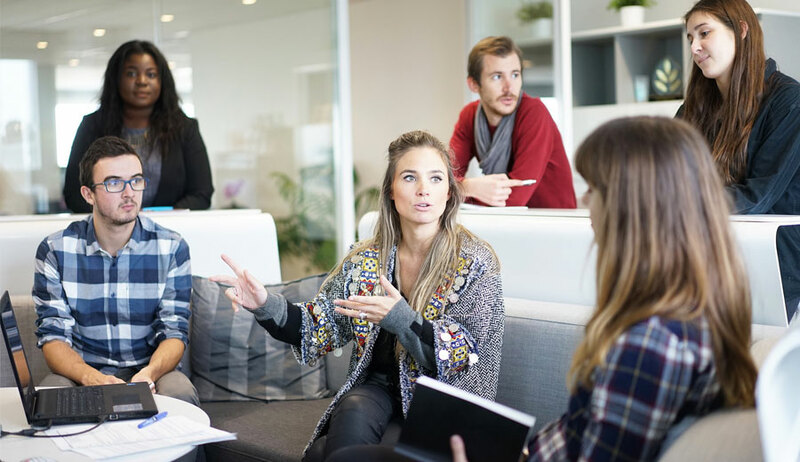 How can we attract, recruit and retain young and talented Millennials? In fact, Millennials’ expectations differ enormously from Generation X and Baby Boomers. 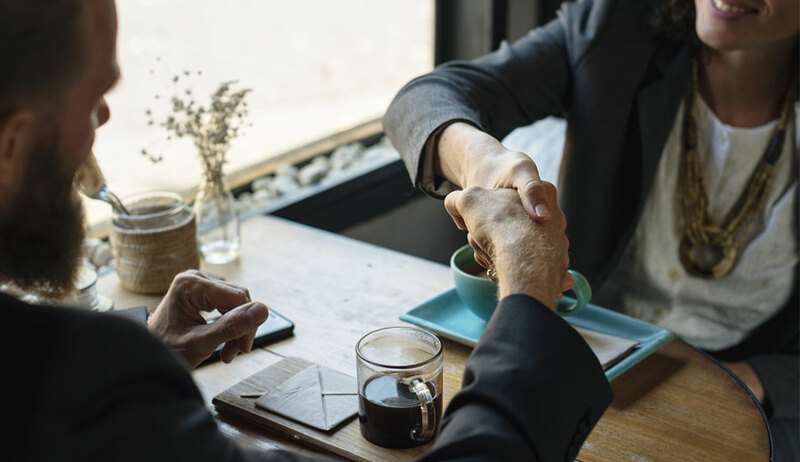 Here are five steps that can help to transform your company into becoming an attractive employer. 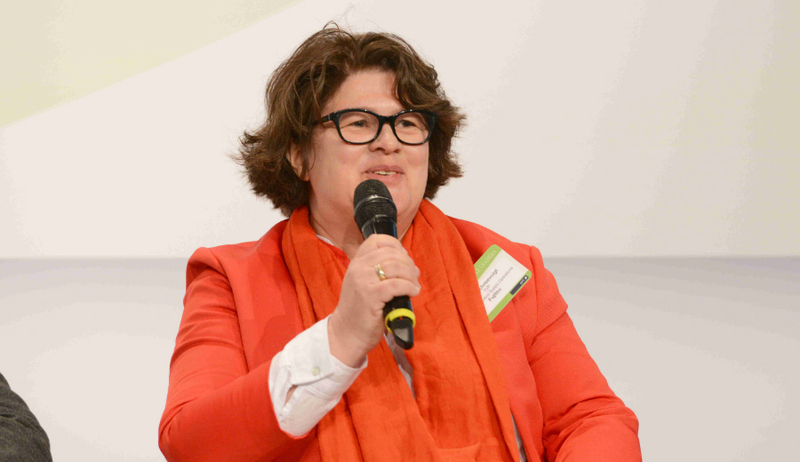 This article introduces the strong woman behind the European Commissioner for Trade function and verifies that the world of international trade is more than just negotiating about import and export conditions. Cynthia Coutu tells an emotional story of losing her job and starting something new that makes her heart sing again. 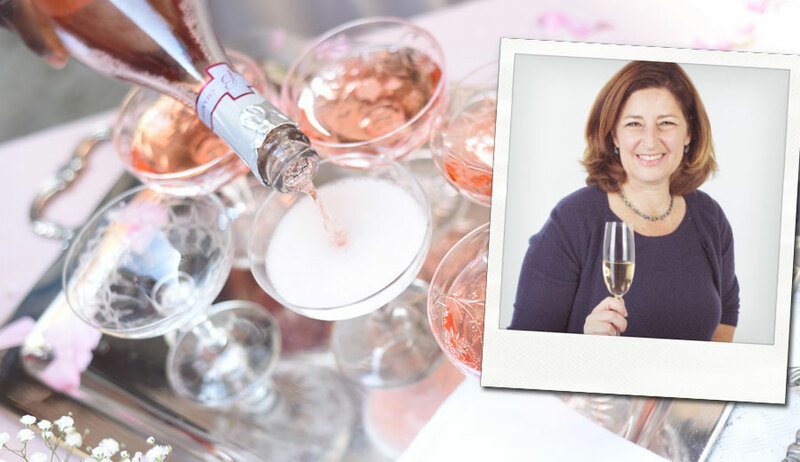 Read more about blending business and the importance of passion! How does it feel like to be the only woman in the room every single day? Would you fail or prevail? Lauren Simmons is the youngest female full-time stockbroker at the New York Stock Exchange. Her incredible story is what makes her so inspiring for millions of women. In this article, we will explain what hyperloops are and why they are the future of transportation. In addition, we will introduce one of the female heads behind the technology development: Dr. Anita Sengupta. It is not possible for civilization to flow backward while there is youth in the world. Youth may be headstrong, but it will advance its allotted length. In this article, Ellen Zentner focusses on the impact of America’s new generations. In this article, Nicole de Paula, CEO at the Global Health Asia Institute, summarizes the major impacts of our unrelenting material growth and consumption on planetary health. She points out the urgency of a new thinking in order to develop innovative solutions to preserve human and planetary health. Future of mobility depends on many political, societal and market environmental factors that are currently undergoing a constant change. How are new market players and generation Y influencing the process of co-creating that future? 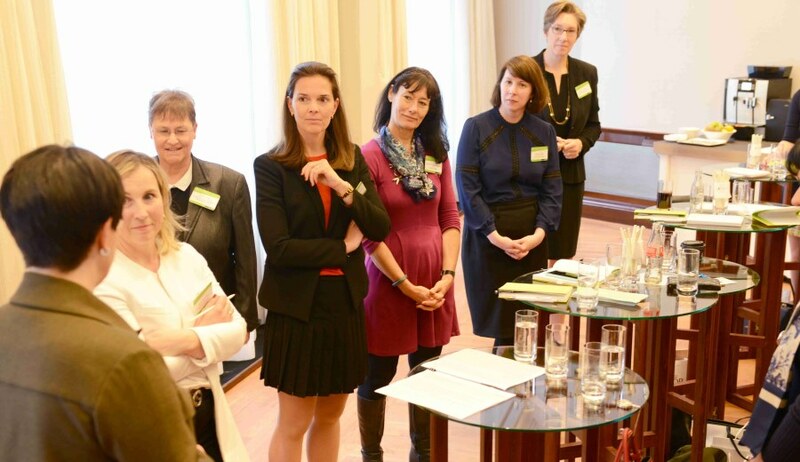 For the first time on a global basis the views of female leaders were brought together. 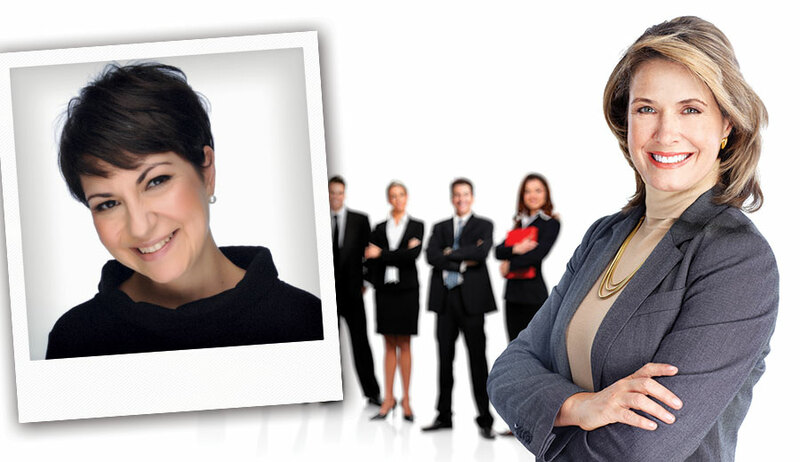 In this article we share some of the key findings of the female workforce. Are female leaders prepared for the economic challenges in furture? Innovative Technology: Can we Reverse the Damage done to our Planet? Everything is possible if you put your mind to it. 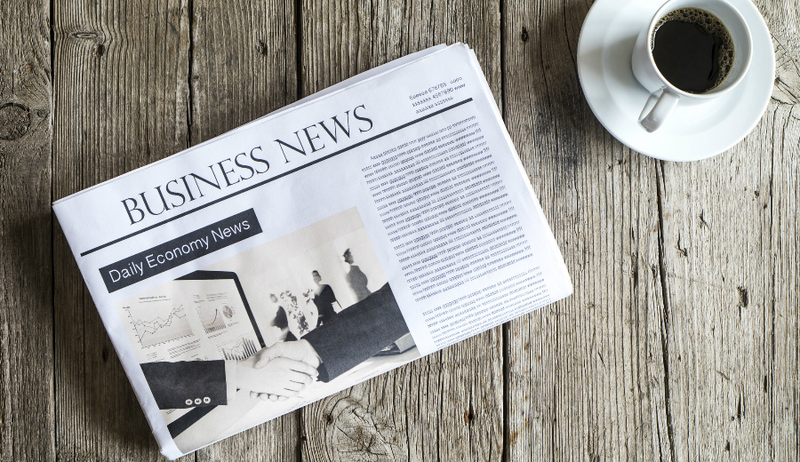 In this article we discuss far-reaching expectations for upcoming years in the battle to bring more sustainable solutions to the corporate world. Can our world ever be sustainable? 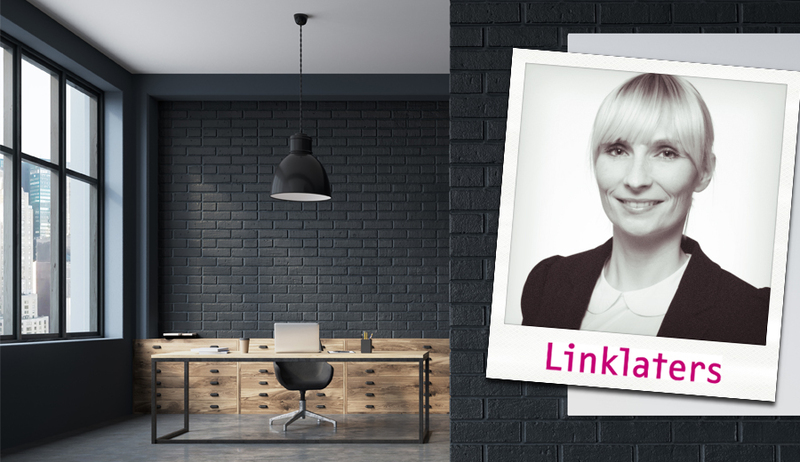 An exclusive women network organised by Linklaters came together to discuss the most pressing themes and to get inspired by great innovative ideas. Experts from MHP - a Porsche company, are discussing themes like new work and changing landscapes. Read how to implement new work products in your company. The discussion about future developments and behaviour of millennials is still ongoing. 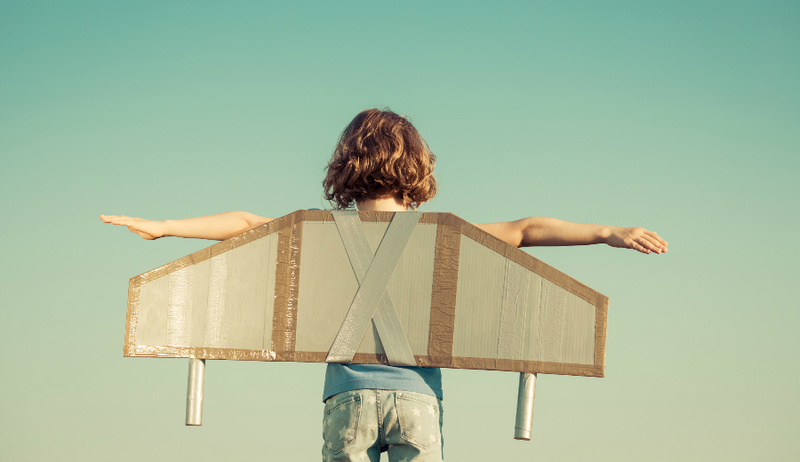 The generation will not only reshape the economy but also change the way we work together. Which effects does the new generation have on the political system? Start Your Journey to Sustainability Now! Sustainability is often seen as a boring topic. But it can be an opportunity for companies to inspire their customers and to build up new business concepts. Four keynote speakers will guide you to make sustainability part of your company. What is the Attitute of Millennials Towards the Tribal World? 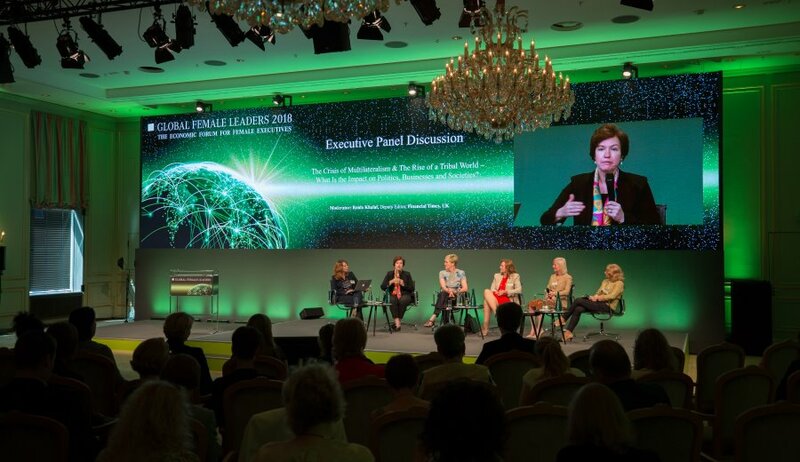 Climate and energy challenges, responsible finance and future of mobility were highly discussed themes at the Global Female Leaders 2018. Read more in our whitepaper! Whitepaper 2018: A Brave New World? 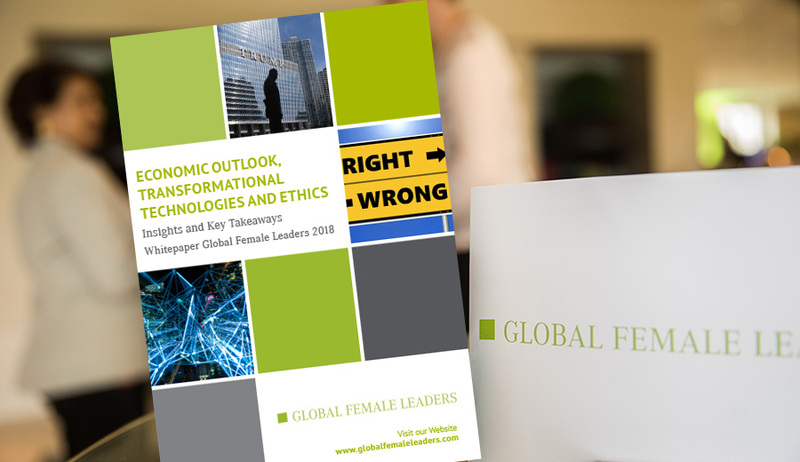 The world new order, transformational technologies and ethics were the first two core pillars which have been addressed at the Global Female Leaders 2018. How can you navigate yourself? Download the first part of the Whitepaper here. 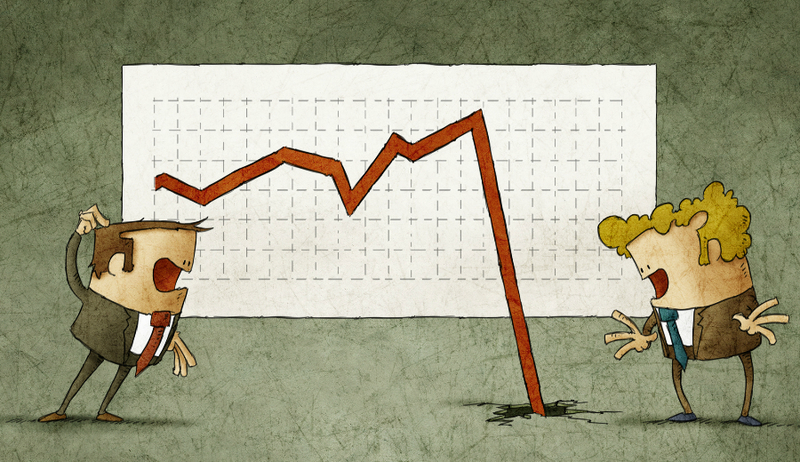 Economic Crises – Will Europe Sit Back and Let it all Happen? In today’s time of global instability, we are, every day, stepping onto uncharted territory. It seems like we have to learn how to rationalise what previously thought irrational given the political and economic disruptions. In the Executive Panel Discussion the impact of Trumps presidency, changing thoughts on globalisation and the “trade war” have been discussed. Considerate Hoteliers, two women doing what they are passionate about - support hotels in getting more profitable though becoming a responsible business. Xenia Prinzessin zu Hohenlohe talked about how they engaged hoteliers to be more sustainable but also how to make sustainability less boring. 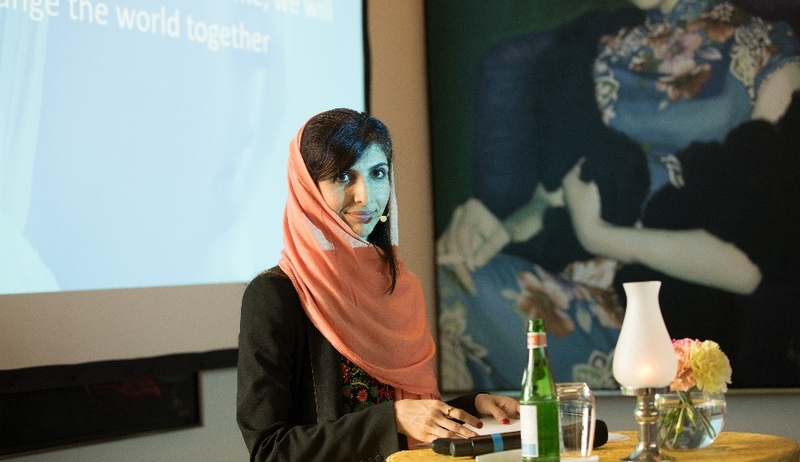 Fiza Farhan, Clean Tech Entrepreneur and Member at UN HLP on Women Economic Empowerment in Pakistan analysis the empowerment of women around the world. Which methods does Pakistan have to fight the gender gap? Read more about the developments in Pakistan compared to other countries. Rasha Oudeh told her story to become a leader. This story proves that leadership is not an inborn, genetically predicted skill but a learnt mindset that can be fostered with education and coaching. What do you think – is leadership genetic or subject to mindset? People, Planet and Profit – The true indicators of performance? Sustainability principals have become an important indicator for the performance of a company. At the same time it is a competitive factor and a corporate goal. 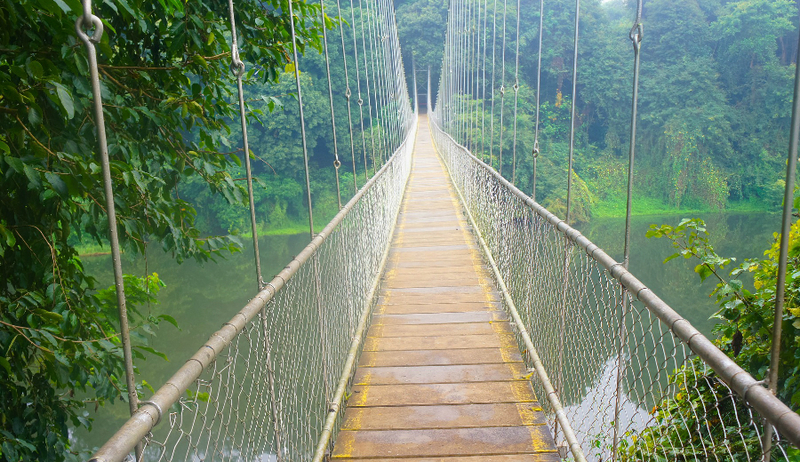 Our expert Paige Wei-Cox is analysing SAP’s commitment to sustainability. How can technology help to improve companies' sustainability and environmental bottom line? The 5th annual Global Female Leaders summit was a great success with overwhelmingly fantastic and encouraging feedback and a lot of positive buzz. Spanning two and a half days, our exclusive platform provided yet again a truly global networking opportunity. There is a strong economic imperative for including women in every part of business and the first ever Global Female Leaders Outlook (GFLO) shows that women are well prepared for the challenge. 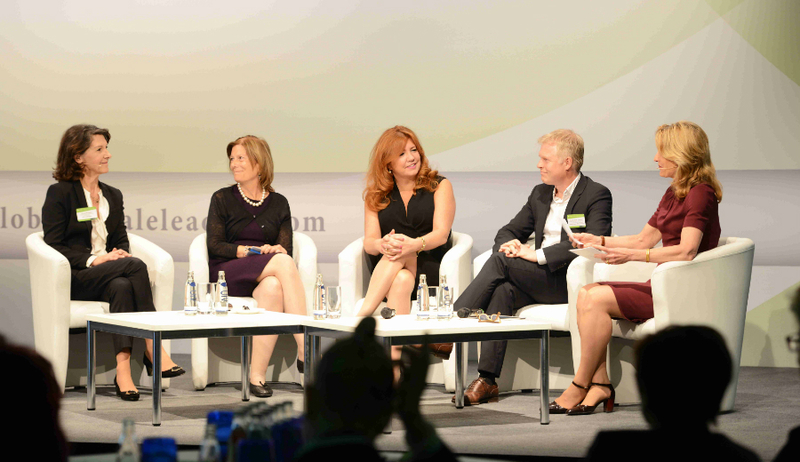 The 5th International Economic Forum for Female Executives took place from 3rd to 5th June, 2018 in Berlin. In specialist circles, this event has become known as the “female Davos” with 300 representatives from economics, science and politics holding discussions on topics about the future and world economy. 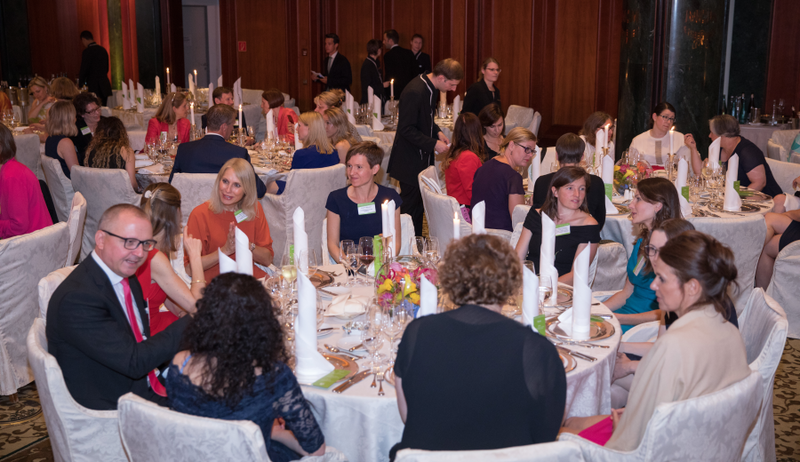 Take a look at a few impressions of our fantastic Gala Dinner at the Global Female Leaders 2018. It has been a great evening with nice discussions and great people! We made sure to capture some impressions from last evening in pictures that we now published on our website. We hope you like them! The preparations for this year’s summit are completed and this afternoon our 5th summit for female executives starts. Have a look at the highlights! 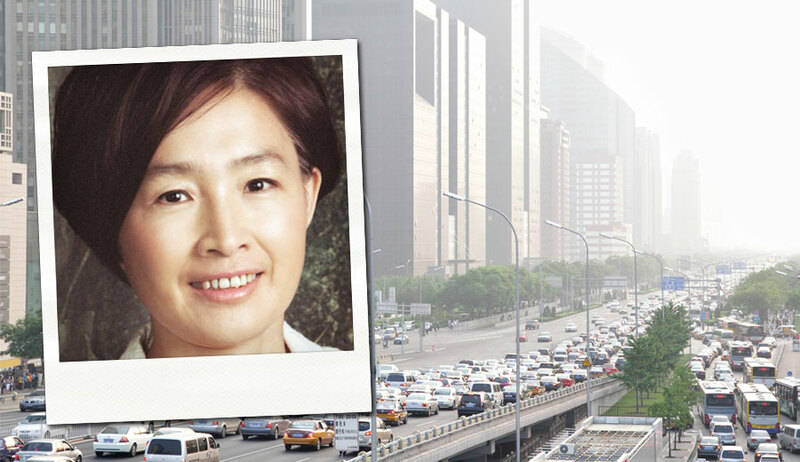 Speaker and expert Mei Ling Chin talks in her article about effective leadership. 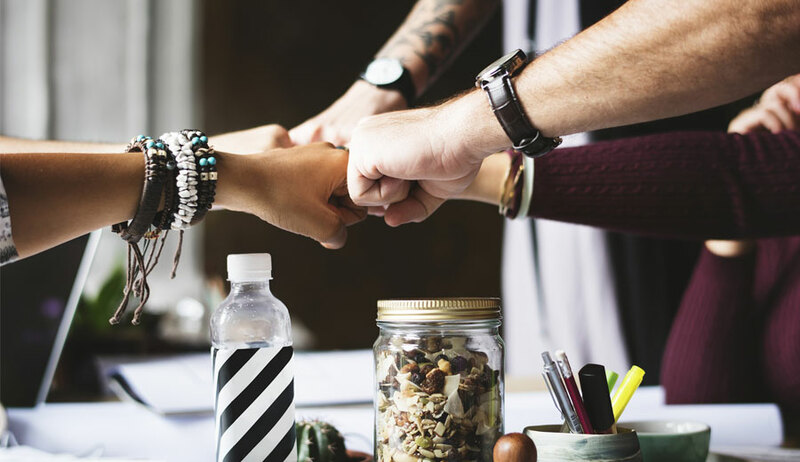 The topic covers three main qualities of effective leadership revolving around workplace well-being and how by having and enhancing these qualities the workplace can be made joyful and healthier to the employee’s mental and physical state. In an increasingly connected world, people have more choices overall. Expert Alexandra van der Ploeg tells us more about the Sustainable Development Goals of the UN and its role in the private sector. Sustainable Development is not a moral but a business imperative which shows the letter to CEOs from Larry Fink. Two years ago Danit Peleg held a great presentation at the Global Female Leaders 2016. We had the honor to meet her again and to ask her about the developments in 3D-printing. How has the fashion industry and the technology changed? The newest missions to space are going beyond the International Space Station (ISS) to the Moon and the Mars. Speaker Ersilia Vaudo Scarpetta talks about new players in the space industry and it’s inspiring future path. The world is changing, politically and socially. New structures are replacing old institutions, and the global economy is changing rapidly as well. Every country is searching for the “best way forward” as digitalisation dramatically accelerates business growth worldwide. What is the impact on the global economy? Digital technologies are key to solve complex problems. Our experts Elke Manjet and Eva Zauke are describing the way when companies go digital. 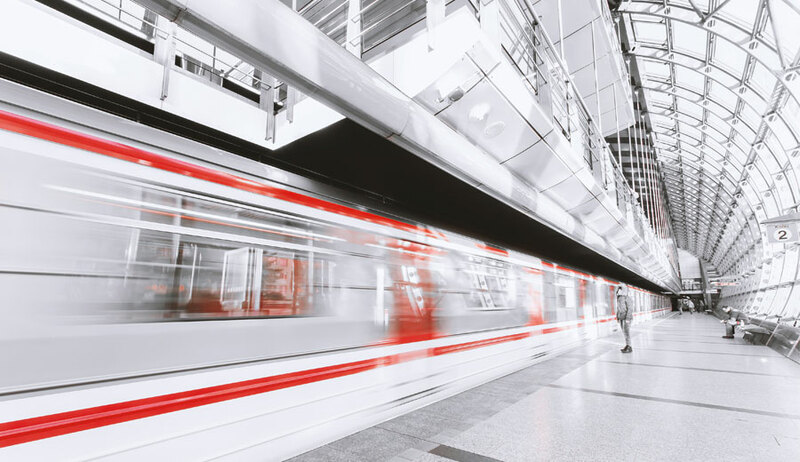 How can technologies and examples of SAP help to push digital transformation? 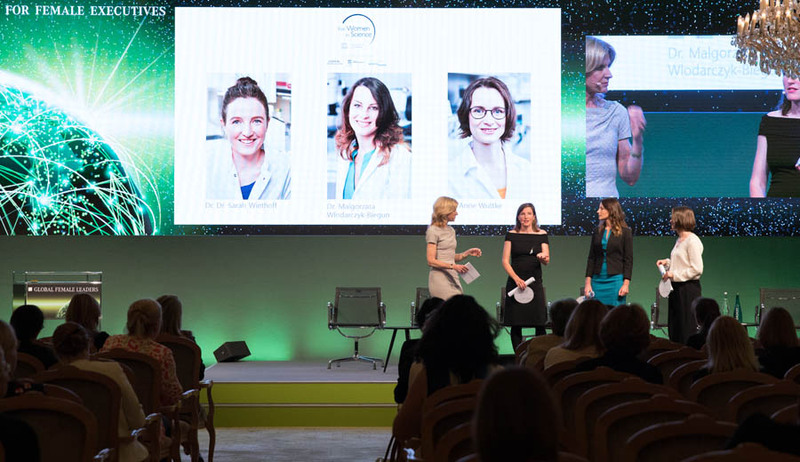 The Global Female Leaders 2018 is very proud to announce the presentation of the German For Women in Science Award. Three scholarships of 20,000 Euro are granted during our summit in June. The women are honored for their major scientific contribution in the fields of medicine, paleontology, molecular biology, ecology and developmental biology. 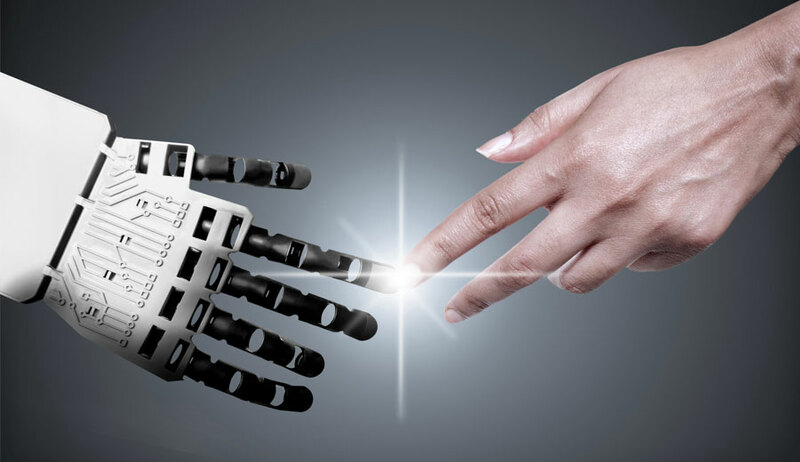 The collaboration of empolyees and machines will affect the success of your business in future. 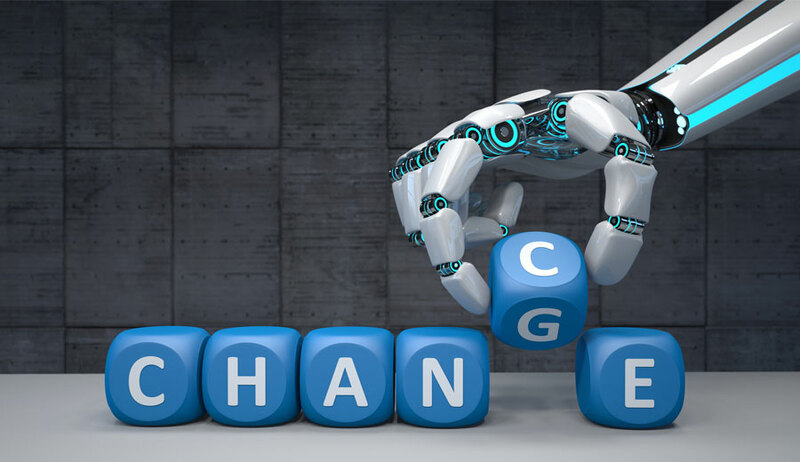 Our partner Accenture provided us with a checklist to create a future workforce between humans and intelligent machines to improve productivity, innovation and growth. Are you ready to take advantage of this opportunity in 2018? 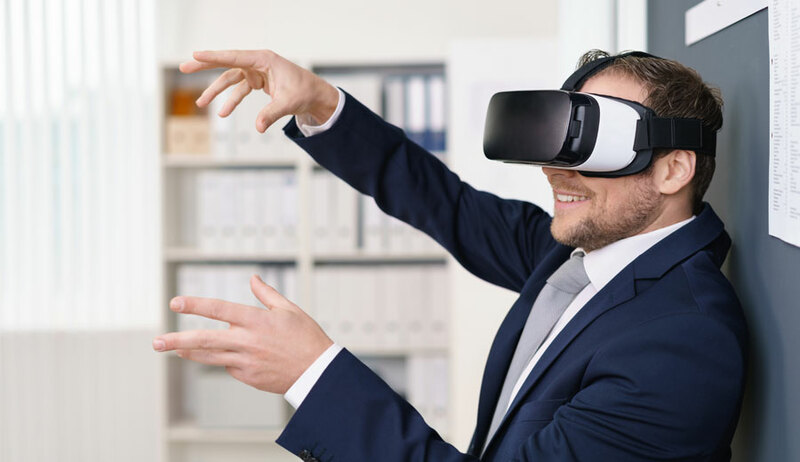 Virtual reality is best known in the gaming world but in fact this technology is also revolutionising the way we work and learn says Devi Kolli, CEO of AiSolve. How is VR changing the training sector? 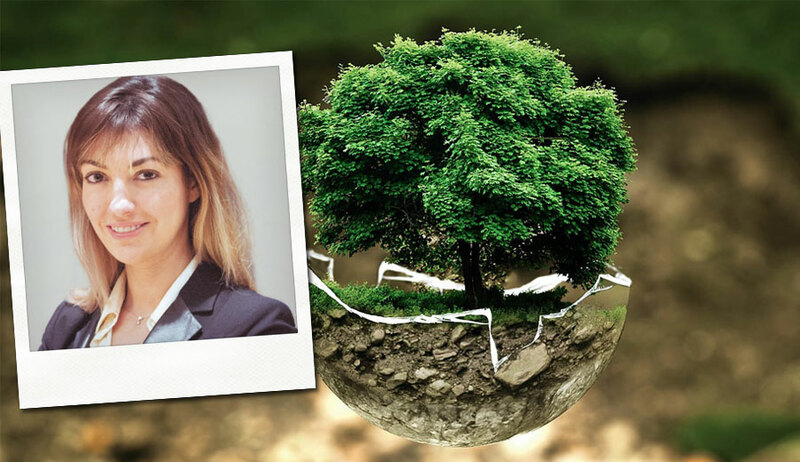 Fiza Farhan tells us more about her career path in the field of sustainability in Pakistan and how the developments in the industry do indeed open up new possibilities. Sustainable Tourism: How can we change Tourism Behaviour? Travelling around the world can enrich your life. But did you ever questioned the impact of your travels? Marianne Gybels working at Booking.com tells us more about sustainable tourism within her project Booking Cares. 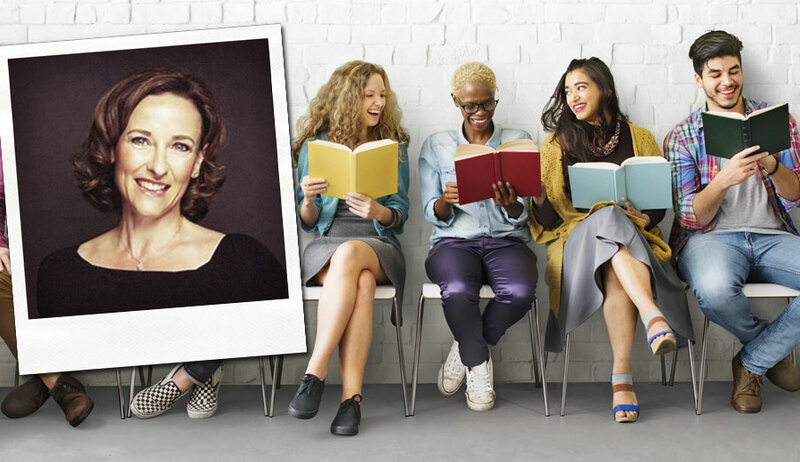 In this interview our expert Martina Macpherson analyses the challenges of gender diversity focusing on the sustainable finance industry. She informs about developments in the past and key equality issues like the gender gap. Sustainability in business and how we treat each other are becoming important topics with raising awareness. Christian Ulbrich, Global CEO and President at JLL, is talking about sustainability as an opportunity and a great responsibility for CEOs. 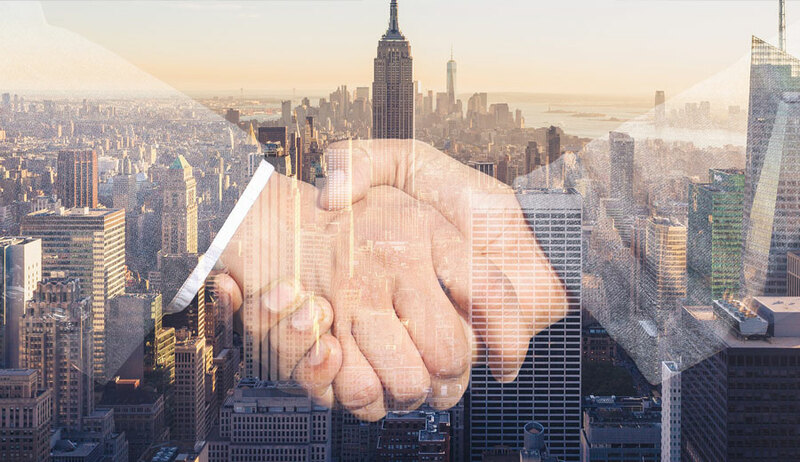 Decentralised storage and authentication of contracts using blockchain technology has greatly increased the potential of Smart Contracts in recent years. Our experts Frederik De Breuck and Elenice Macedo answer the questions about the definition of Smart Contracts and how they work in practice. The workplace IKEA in home solar shows that diverse teams are more successful and create a positive energy. Alejandro Castro Pérez talks about his personal experiences with women in leadership positions during his career path. Today on the International Women’s Day 2018 it is one year ago since State Street Global Advisors installed the statue of a Fearless Girl opposite the Charging Bull of Wall Street. What happened with the Fearless Girl and what impact has it had on raising awareness? 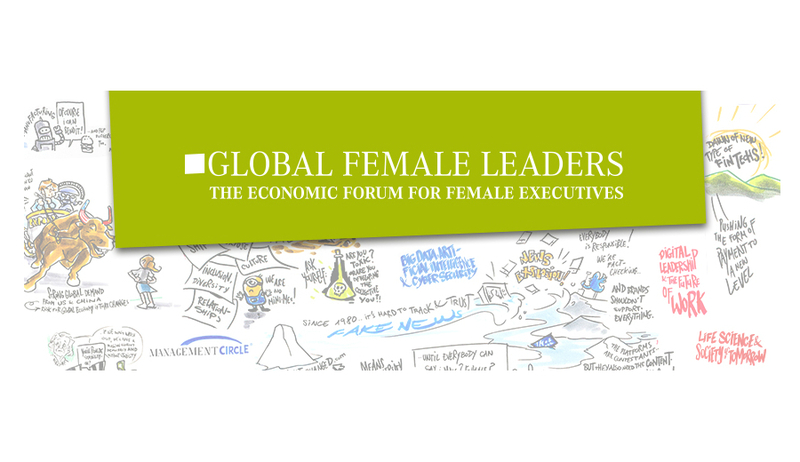 Global Female Leaders Outlook (GFLO): We want your VOICE! 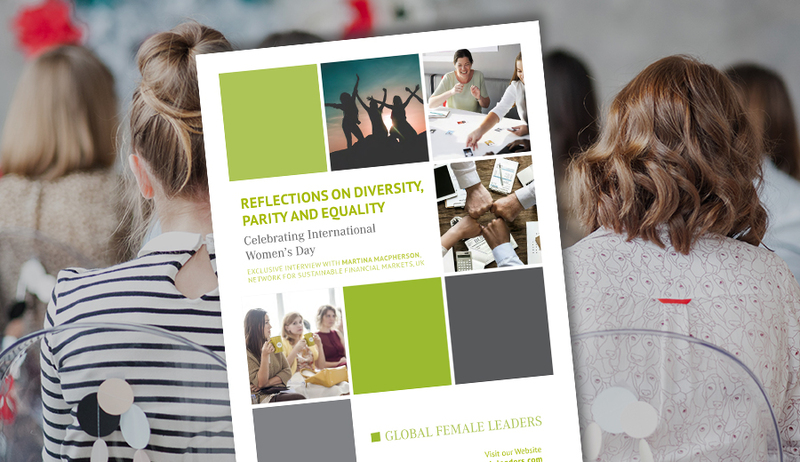 In cooperation, the Global Female Leaders with KPMG International and KPMG in Germany have decided to conduct the study Global Female Leaders Outlook (GFLO) in order to prioritise - for the first time on a global basis - the views of female leaders. Be part of this study! In the interview with Florencia Velasco on her personal experiences und feelings during her career path, we also discussed about different steps and decisions of the role as a female leader. 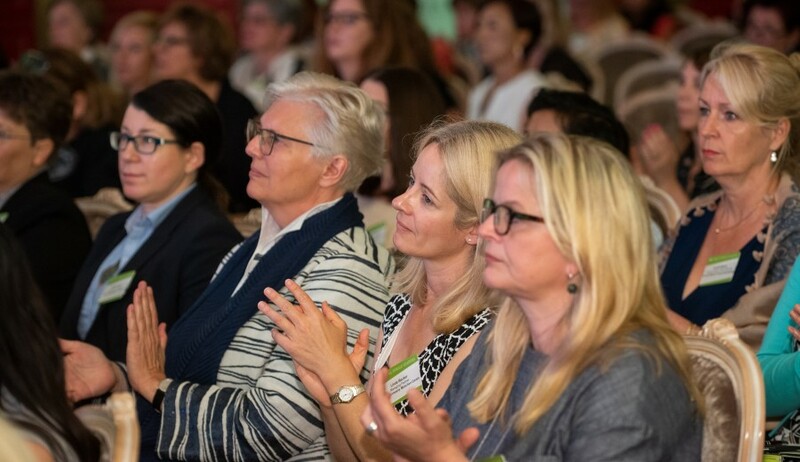 We are delighted to announce that two networking events will take place this year before the Global Female Leaders summit starts on June 3rd, 2018 at the Hotel Adlon Kempinski Berlin, Germany. The events will take place in Boston and London. Medical decision-making especially in emergency situations is not easy. 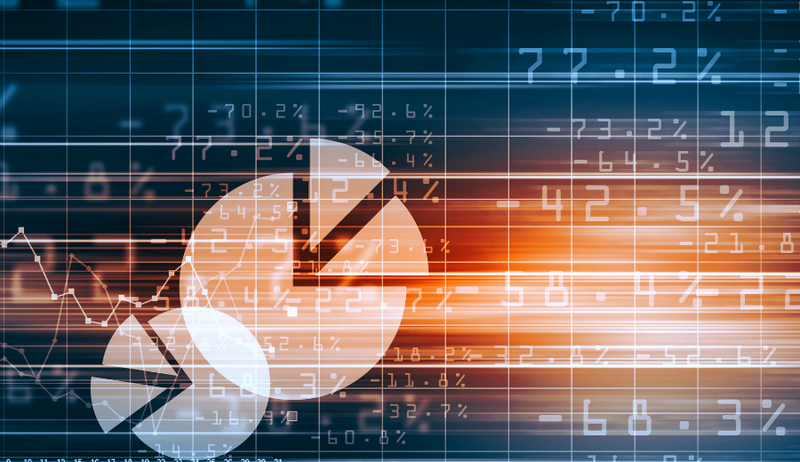 Tools like machine learning or the decision tree can help to evaluate the opportunities. 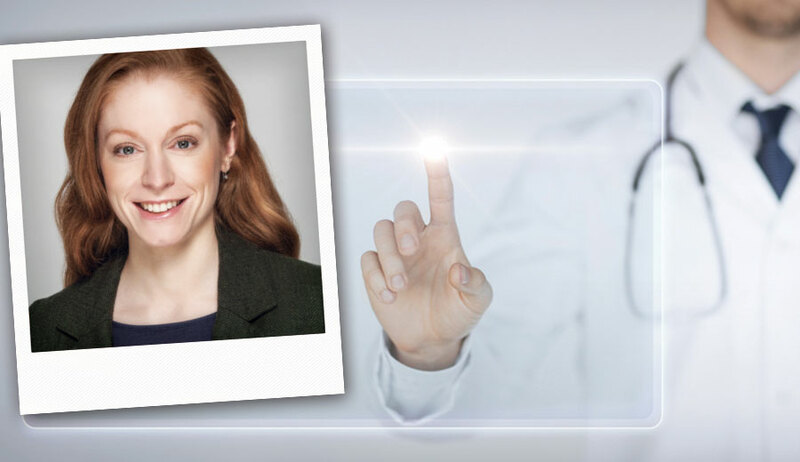 Read the interview with Dr Mirjam Jenny to learn more about the digitalisation process in the medicine industry. It is a great challenge to work as a women entrepreneur in the Middle East. Over the past years, efforts from the government and the business sector have improved the status of women in business but there is still a long way to go. What is your opinion about the gender equality in the Middle East? 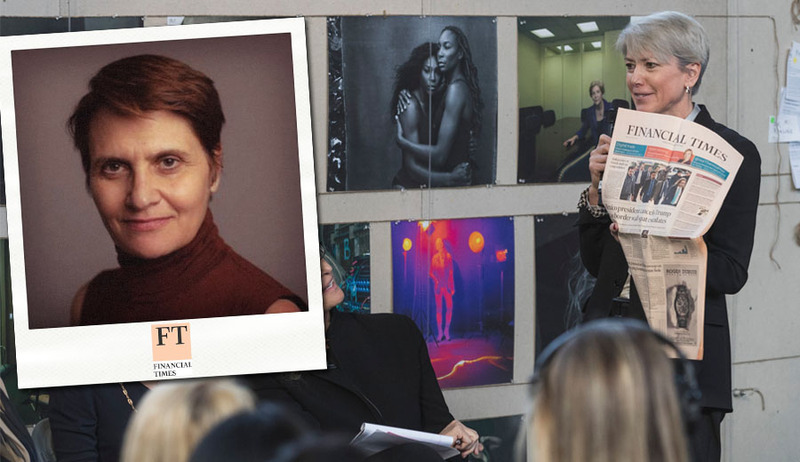 Speaker Claudine Blamey talked to us about her career journey and her private life. 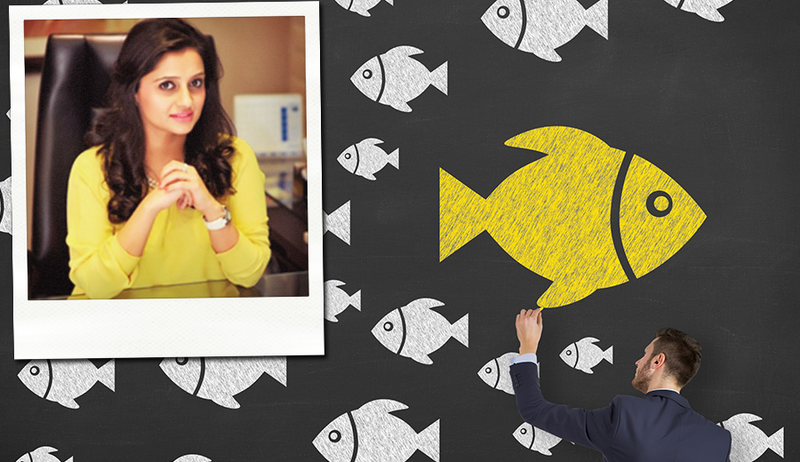 On the one hand she is a female entrepreneur and ready to cross borders and on the other hand she is a mother. How is all this kept under control? Innovative technologies like Augmented Reality changes the way we learn in future. We talked about Augmented Reality in education with Darya Yegorina who is the CEO of CleverBooks. What is Augmented Reality and how is Augmented Reality changing the landscape of education and teaching methods? China is top carbon polluter. 12 highlights will reflect the year 2017 in regards to sustainable development. Can China go green? 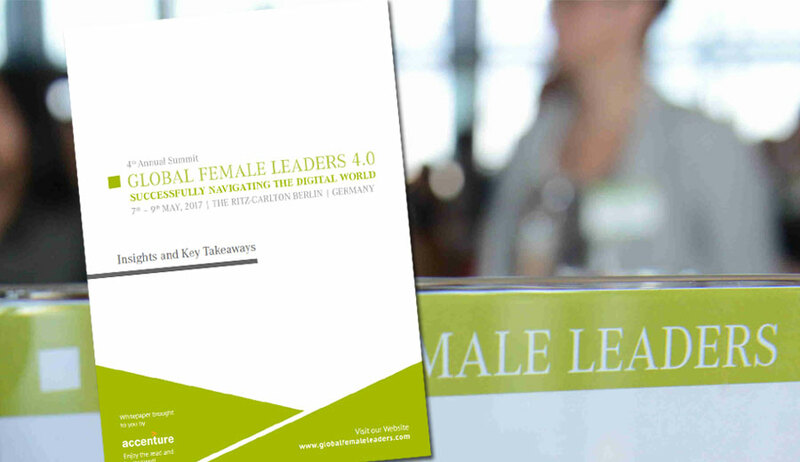 “Companies that lack proactive digital strategies and leadership will struggle to survive.” These were the words Dr Melinda Crane used to introduce Dr Linda Sharkey, who showed us how to futureproof our workplaces at Global Female Leaders 2017. Today we published her talk from GFL17 on our YouTube channel. GFL17: Download the Official White Paper! 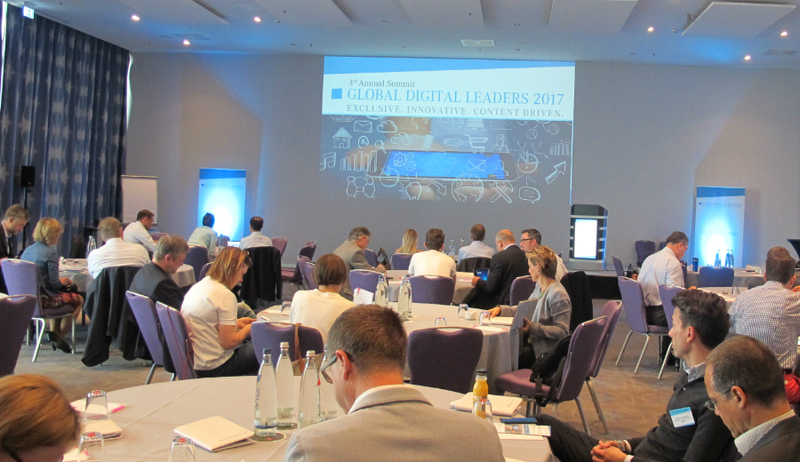 The Global Female Leaders Summit 2017 took place from 7th to 9th May at The Ritz-Carlton in Berlin. 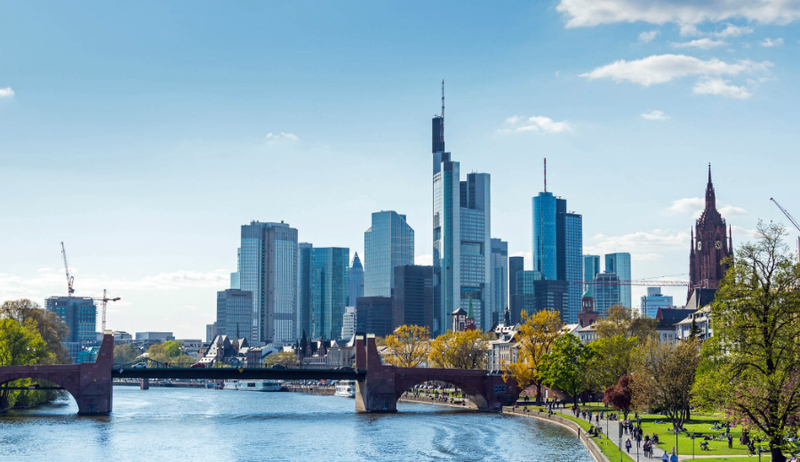 Over 250 top-level executives gathered in the German capital in order to discuss five of the most pressing economic and political challenges humanity faces today. Download the White Paper! 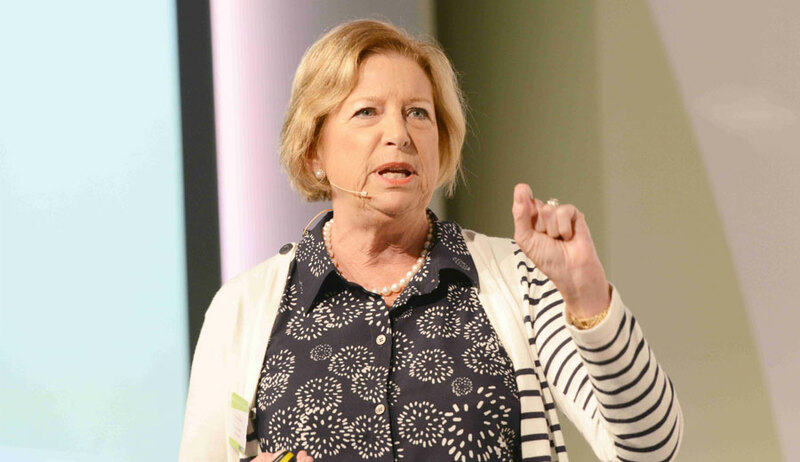 At Global Female Leaders 2017 Ranj Begley showed us how her company uses data in order to better satisfy their customers. She works at Readly UK and her company is known as the "Spotify of Magazines". Today we uploaded video footage of her session to our YouTube channel for you. Enjoy the video! 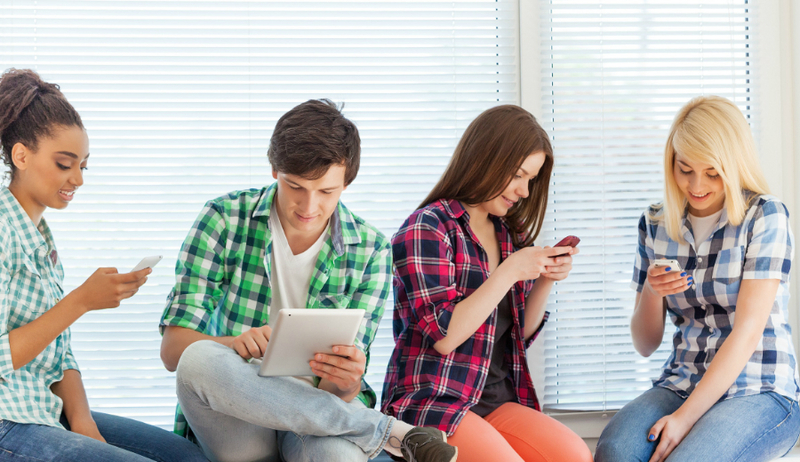 Do Companies need Guidelines for Dealing with Gen Z? Leadership means having to deal with teams of employees. These are often very diverse teams consisting of people of different gender, ethnic or cultural background... and different age. And one of the most immediate question many leaders ask themselves is how to deal with a very specific age group. Globalisation is a very divisive term. For some it means prosperity, free trade and a free circulation of goods. For others, however, it is connected to international corporations. Learn now about the consequences of the crisis of globalisation. Silos appear in every organisation. They can be defined as groups of employees that work mostly autonomously. But how can we avoid that departments work alone and disonnected? 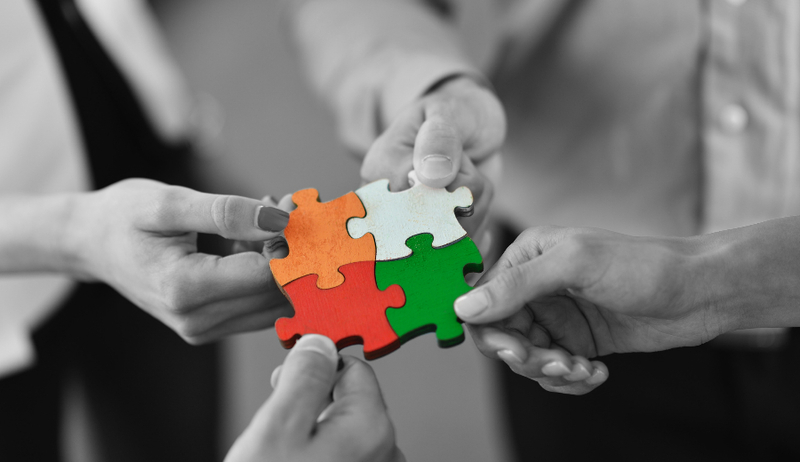 Learn now about the silo phenomenon and how to support relationships in your organisation. Good news everyone! Today we published the memorable Spotlight Session Samantha Payne presented at Global Female Leaders 2017. You can watch it on YouTube. We hope that you will enjoy the video as much as we did. We all were very moved by her talk and listening to her again still has an extraordinary effect. What is fake news? And why is it such a problem? This question is quite complicated. 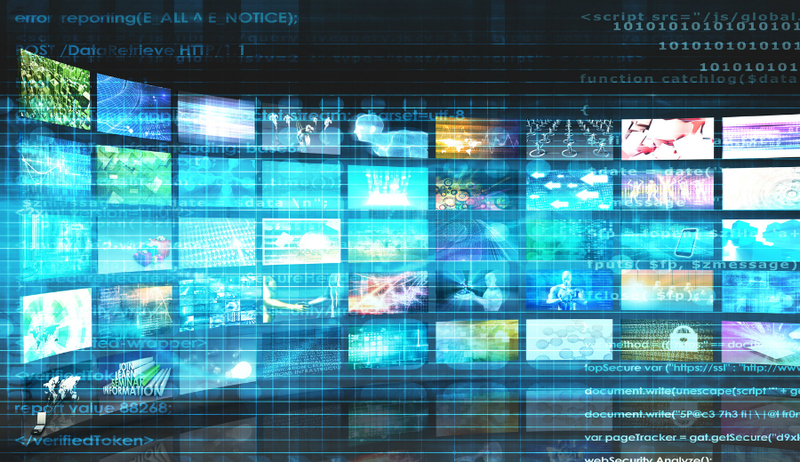 Read now about the seven types of mis- and disinformation and the phenomenon of fake news from the web and learn some in-depth thoughts about the actual problem with Donald Trump regarding this topic. What's the future of the Smart City? We don't know, and it probably depends on the specific country you are looking at. But we are very keen on finding out, since there is so many innovation happening simultaneously that could influence the future of our urban areas! Last week, we looked at 3 skills future leaders will need to steer their companies in the right direction. The article mainly revolved around what we call "soft-skills" today, even though they are becoming just as, if not even more important that, say, performing magic tricks with Excel. Last week, we talked about the impact of automation on the labour market. We saw that in the future a lot of jobs will be replaced by robots, algorithms and artificial intelligence. Most industries will be heavily automated in the future and virtually every mundane or repetitive jobs will be replaced. The Impact of Automation: How Many Jobs Will We Lose? Consider this: technically, almost every job we know can be done by robots or algorithms. And the machines are even *better* than we are at most of them. Would you have thought these jobs could be automated ten years ago? They have different shticks and strategies, faces and can be male or female. But we all know the, and we just have the most horrible time dealing with them: toxic coworkers. " How do you manage toxic peers? " Artificial Intelligence poses many ethical questions for humanity. How do we transition to a society in which we will work side by side with robot colleagues? How do we programme "ethical" code? Where are the limits of AI, that is, if there are any? A big THANK YOU to all of our yesterday’s speakers. Get ready for our Tuesday highlights! Good Morning again. We wanted to take the opportunity to thank all of yesterday’s speakers for their amazing insights! In case you were partaking at the Sight Running: Welcome back! Let's get started with our Tuesday highlights! Stopping the Blame Game: How can we Induce a Lasting Change in Corporate Culture? "You have to learn from your mistakes!" This is something we tell our children and even ourselves, at least at a personal level. Making mistakes, especially big ones, can bring about powerful experiences that provide us with life lessons for our future. Customer-Centric Thinking is one of these topics that are in the very centre of everything that touches today's economy. You know the disruption that is caused by all these technology companies and start-ups that are basically nothing more than an app but simultaneously worth trillions of dollars! Last week we took some time to fulfill a promise: we sifted through all of the questions you posed on our Global Female Leaders App during the 2017 summit in order to address them on our blog. The first one was big, especially for a Monday! But, nevertheless, we will talk about it today. With Artificial Intelligence on the Rise – Will we even *Need* Leaders any Longer? One of the summit’s major themes this year was – you guessed it – artificial intelligence. It influcenced most of our discussions and is important for nearly every relevant economic issue. Concerning this topic, we had the pleasure of talking to Vera Schneevoigt from Fujitsu. So Global Female Leaders 2017 is history. But that doesn't mean we will wait until 2018 to provide you with more content on the topics we discussed at the summit. Actually, we will try to provide you with premium insights on them for the whole upcoming year. You would like to stand out from the crowd and succeed? To succeed, you need a unique value proposition, diverse revenue streams and loads of creativity. Disruptive innovation is a business model problem, not only a technology problem. But how do you disrupt? Touching Points between Humanity and Technology. This was Global Female Leaders 2017! 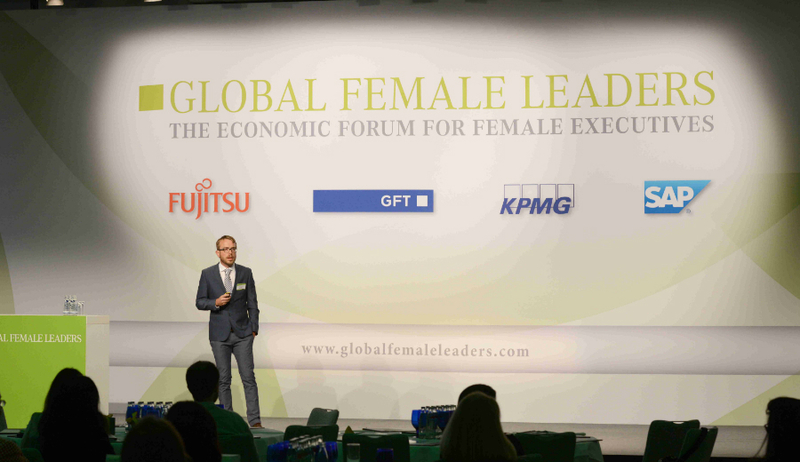 Global Female Leaders 2017 was an amazing experience, and while our company may manage the organisational tasks, it is you who make this a special event. We are back in our Eschborn office now and we wanted to take this opportunity to look back on three fantastic days. Good Morning again. Please feel free to enjoy our Networking Breakfast, or, in case you were partaking in the Sight Running: Welcome back! Let's prepare for our Tuesday Highlights, shall we? Our Tuesday afternoon is all about the topic of Digitisation. 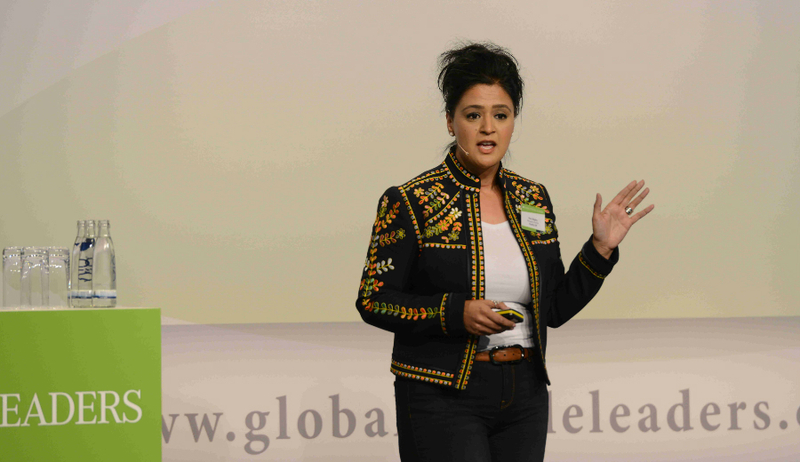 The world new order, transformational technologies and ethics were the first two core pillars which have been addressed at the Global Female Leaders 2018. Download the first part of the Whitepaper here. Download: Whitepaper 2018 - A Brave New World?